See my first post on this topic here. After a recording session and soccer practice Saturday, I was sitting in a booth at Taco Bell checking out my Instagram when this popped up. I was a little stunned. Zachary Catazaro is a local celebrity in Northeast Ohio. He was the little boy who left Canton Ohio and made it all the way to the New York City Ballet where he climbed through the ranks up to Principal Dancer. Whenever he comes back to Canton to perform or teach, it's a big deal. He also appears in a new movie on Hulu, and is in the Disney feature film, The Nutcracker, coming out this holiday season. Back in the 80s, I knew his mom so I have been following his career with interest. Last week, Zachary was fired from his position at the New York City Ballet. He was involved in a scandal involving pictures and videos of a sexual nature taken of a female dancer without her consent or knowledge. That dancer has filed a lawsuit against the New York City Ballet and against her former boyfriend, Chase Finlay. Zachary is not a defendant in the lawsuit and did not take any pictures. For all we know, he was just on the group text that Mr. Finlay initiated. You can read all about that here. As the mother of four adult sons, I feel compelled to write this. 1. Guys, this is not 1885 or even 1985. Whatever you write online, on social media, in a text or even in a private forum CAN come back to haunt you in the future. You can even have things that you write or post taken out of context and used against you. Do not write, post or distribute anything that you would not want your mother, priest/pastor, or future employer to see. 2. I think it is common sense to mention that the same should be said for writing the old fashion way - with letters and notes. Don't write anything that someone can save or intercept and use against you. 3. If someone sends you something inappropriate or of an indecent or lewd nature, delete it and ask to be taken off of the recipient list or group text. Silence implies consent. It may be that all Zachary did was receive these posts. It might also be that he just replied to them. It doesn't matter if this happened on the job or during private time. In this era of "Me Too," that's all it takes to lose a job and jeopardize a career. It's not worth it. 4. Age is not an excuse. Yesterday accusations came out against Judge Kavanaugh of sexual misconduct when he was a teenager. I'll post on that tomorrow, but the point is, stuff that happens even as far back as high school can come back to sully your life and your accomplishments years later. Live your life above reproach and that includes in social media and texting. Don't leave a paper (or electronic) trail that can convict you in the future. Be above that. 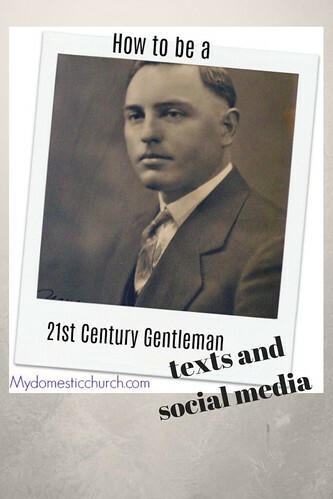 Be a gentleman in your communications too.